Here is a special guest blog post by Abi Barrou of Food for the Hungry. We love traveling because it is like dreaming or being out of our reality. When we travel we are open to learn and appreciate things without the pressure of routine. Almost two weeks ago we at Food for the Hungry were about ready to receive the Blackhawk team in Bolivia. We had a lot to do with them and the people in Lajastambo during the week they planned to be in Bolivia. The days were filled with activities, emotions and encounters of people very different from each other. As teams coordinator for FH Bolivia I love to experience these brief periods of life with so many people from American churches. It is exciting to visit sponsored children and their families, besides other moments that we get to enjoy. With this visit a moment that warmed my heart was the evening service in Kuchutambo. I loved to see the faces of some children while worshiping the Lord who unites us. 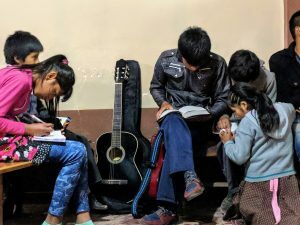 When I was translating Tom’s sermon in front of the church I could see how interested these children were to find the Bible verses in their own Bibles. It gave me hope to see young men involved in leading the church to worship and one of them as the secretary of the church. The sky full of stars was beautifully showing unknown constellations to those who were coming from the Northern hemisphere. As in the past, the church offered to us a cup of herbal tea and buñuelos. Paul encourages us to not think of ourselves more highly than we ought. It is hard to do so when we are close to very vulnerable people. In Kuchutambo the simplicity of people revealed to me my lack of it. I hope to enjoy more visits like this with Blackhawk teams. Back to real life I hope each team member has the time to chew on this experience of visiting Bolivia. The wealth we experienced during our time in Lajastombo was richer than any money or experiences we could have had here! We are very grateful for the hard work the FH team put into making our visit so powerful and unforgettable! For me, visiting the families of children or new members of the Rio Jordon was most impactful. To see many of the men of the church taking time to love on those in the “periphery” impacted not just the Bolivians! Thank you Abi and all! Abi, I was moved by the kids digging in the Bible, too. Such a sweet picture of wanting to know God for themselves! Miss you and thank you for the work and prayers from you and the whole FH staff. You are in my prayers as well!